Life with two sure has been an adjustment. 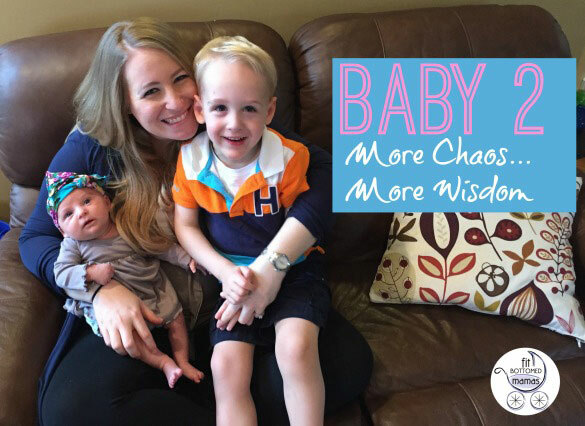 Laundry piles up quickly when you add a second child, and I can do more than I ever thought I could while nursing, I’ve learned to pick my battles more (with my 2-year-old), and I haven’t been punctual since Sadie came home. That whole “sleep when the baby sleeps” advice you followed the first time around? Yep, it’s pretty much impossible. When one is napping the other one is awake, and well, it’s a cycle from there. I went from entertaining my one child to just trying to keep two of them breathing. I couldn’t even begin to explain what my days are like because no two days are the same. The sound of cries or a little voice screaming “Mommy” take up all my silence. My life will never, ever be the same. I don’t even know what relaxation feels like, nor do I remember what the sound of silence is. With one I could juggle the day and my schedule easily; with two, I’m always worried about forgetting one! I often wonder how moms (Erin!) do it with more! I vaguely remember the fear I had during my pregnancy with Sadie. Worrying about how I would ever find enough room in my heart for another piece of me and Jake. I wondered how this baby I was about to bring into the world would ever receive the amount of love I already had for Evan. I had a fear of never giving enough, never giving all I’ve given him. Aside from the obviously busy schedule, I am completely head over heels in love. This love is nothing like the love I have for Evan — that is special for him. This love is a love I could never feel for Evan, it is a love for Sadie alone. Each one of my children hold their own space in my world, a space that is their own, to be shared by only them. I do not love one more than the other, I love them differently but I love both of them with every ounce of my being. I don’t fear everything the way I did with Evan; those new mommy scares. However, I fear in a different way. I don’t run to the pediatrician with every sneeze, but I question everything she does differently than what I’m “used” to, what I’ve already experienced with my first. I may not jump at every cry, but I let her know I’m here with every noise she makes. I’m learning that life is less about making time for everything and more about finding balance. We are in a different stage of our life, one that pulls us into our own little world more often than before. Evan is getting older, and our weekends are consumed with birthday parties. Sadie’s schedule is still demanding at this point of her life; we get to events and gatherings late and tend to leave early. The one thing I’ve learned upon having a second is that I don’t owe anyone anything. Now, more than ever I need to do what’s best for my family and I worry less about how it may affect others. I was always concerned with missing things, with being left out and left behind. Now, all I care about is keeping my kids happy, safe and healthy. Life with two is hectic and chaotic, but I love my perfectly chaotic ever-changing life.